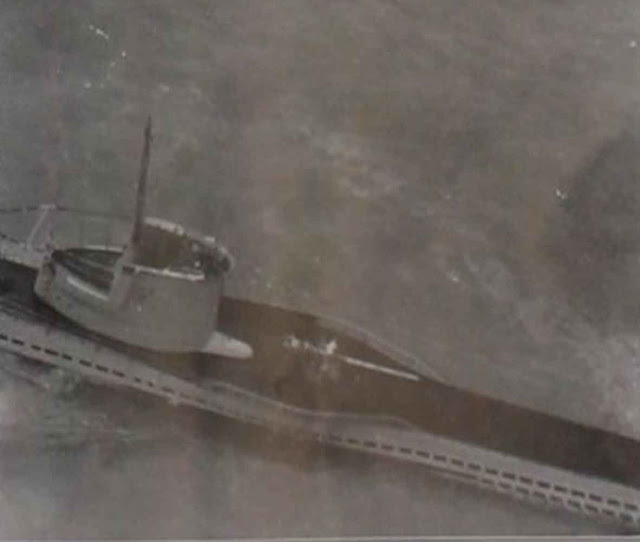 A picture of U-31 taken from one of the Bristol Blenheim bombers that sank her on 22 March 1940. The Soviets get a lease on the port of Hango. While the terms give the Soviets all of their war aims, the losses are acceptable given the alternative of complete and utter defeat and occupation. The Finnish Ministry of Foreign Affairs publishes a bulletin telling the public of the peace talks. Thirteen members of the Foreign Affairs Committee of the Finnish Parliament vote for the peace terms. There are only four votes against. The success of the vote is leaked to the media in time for publication in Swedish evening newspapers. This news is published even before the negotiators meet at 18:00, causing a major embarrassment for the Finnish government. Chamberlain and Daladier, obviously informed of the proceedings, try to prevent the Finnish capitulation by announcing that they will send help to Finland despite the lack of a formal Finnish request. This comes to naught with the announcement of the peace deal. However, the original idea to send troops to Narvik remains on the minds of the British and French. The entire idea all along, in fact, was a cynical use of the Finnish difficulties as a pretext to occupy the iron ore mines so that Hitler could not use them. Winter War Army Operations: Soviet forces score breakthroughs against the Finnish forces which are learning about the peace deal. There are Soviet attacks all around Viipuri, and five Soviet tanks reach Tammisuo station in the northeast. The Soviets launch an offensive at Vuosalmi that the Finns stop with great difficulty and heavy loss of life. Finnish fighters engage a flight of five DB-3 Soviet bombers near Kouvola and shoot one down near Loviisa. This is the final aerial victory of the war. The Finns lose a Fiat flown by an Italian volunteer who perishes, SSgt Diego Manzocchi, on the ice of Ikolanjarvi. He was shot in the chest and then hangs upside down in his crashed plane for six hours before expiring. Battle of the Atlantic: U-31 (Kapitänleutnant Johannes Habekost) is undergoing sea trials at Jadebusen (Jade Bay) near the Wilhelmshaven naval base when the RAF takes it by surprise. RAF Bristol Blenheim Bombers of No. 82 Squadron drop 4 anti-submarine bombs on it. Two of them hit and sink U-31 at Schilling Roads, northwest Germany, near Borkum. Not only are all 58 crew lost, but also 10 dock workers putting finishing touches on U-31. It is the first solo sinking of a U-boat by the RAF. U-31 sinks in shallow waters and the Germans immediately think about raising it. U-28 (Kapitänleutnant Günter Kuhnke) torpedoes and sinks 6,236-ton Dutch tanker Eulota about 120 miles west of Quessant. All 42 on board survive. The Eulota breaks in two but, incredibly, does not sink. The crew reboards until spotted by British destroyers HMS Broke and Wild Swan, who rescue the crew (42 survive) and then sink the flaming remnants of the tanker. French battleship Bretagne sails from Toulon for Canada carrying 2,379 gold bars, accompanied by cruiser Algérie. Kriegsmarine commerce raiders Schiff 16-Atlantis, Schiff 21-Widder, and Schiff 36-Orion set sail through the Kaiser-Wilhelm canal into the North Sea. U-101 (Kapitänleutnant Fritz Frauenheim) is commissioned. US freighter Exmoor is released from detention at Gibraltar. Convoy OA 108GF departs Southend, Convoy OB 107 departs Liverpool, Convoy OG 21 forms at Gibraltar. European Air Operations: During the attack on U-31 at Schilling Roads, the Bristol Blenheim bombers press their attack so low that they are damaged by the bomb explosions. Squadron Leader Miles Villiers 'Paddy' Delap is (subsequently) awarded the Distinguished Flying Cross for his actions. A dogfight between French and Luftwaffe fighters results in one French fighter lost. US Government: Undersecretary of State Sumner Welles meets with the King, PM Chamberlain, and Lord Halifax. King George VI has tea with the American and emphasizes that he desires no peace without the complete destruction of the Nazi regime. Chamberlain merely restates his position from his 24 February 1940 speech. Welles continues to push his vague idea of mutual disarmament. The US government lifts its arms embargo sufficiently to permit the British to purchase Curtiss P40 Warhawk fighter planes, which is the beginning of the tilt of the US government in favor of the British. British/Norwegian Relations: The British and Norwegians sign a trade deal. Trade deals are an almost infallible sign of how a neutral country is leaning. German/Italian Relations: German Foreign Minister Ribbentrop continues his visit to Rome with visits to the King of Italy and the Pope. He concludes his visit with a meeting with Count Ciano, promoting the "shared destiny of fascist nations," and then with Mussolini interpreter Dr. Schmidt (who describes Ribbentrop's speaking style as "flatulent"), and then returns to Berlin after an open car ride - Hitler-style - through cheering Roman crowds with Ciano. New Zealand: The budget shows an $8 million shortfall due to war expenditures, which the government hopes the public will cover through donations. British Homefront: Meat rationing begins. The rule is 1s 10d (9 pence) per meat per person per week. Poultry, game, offal, sausage, and pies are not rationed. The ration amount works out to 1 pound of joint of lamb or beef. Restaurants are not rationed. The public is encouraged to grow its own food, but it is difficult to grow a cow in your garden. The highlands of Scotland after today are officially off-limits to non-authorized personnel due to the presence of British naval bases. 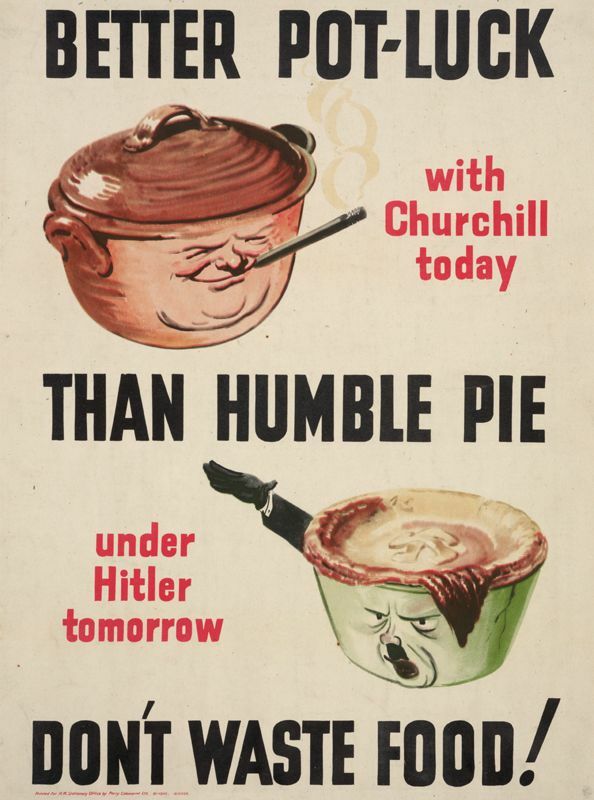 A poster used in the British campaign to economize on food.